See the entire Today’s Dietitian infographic at the end of the article. 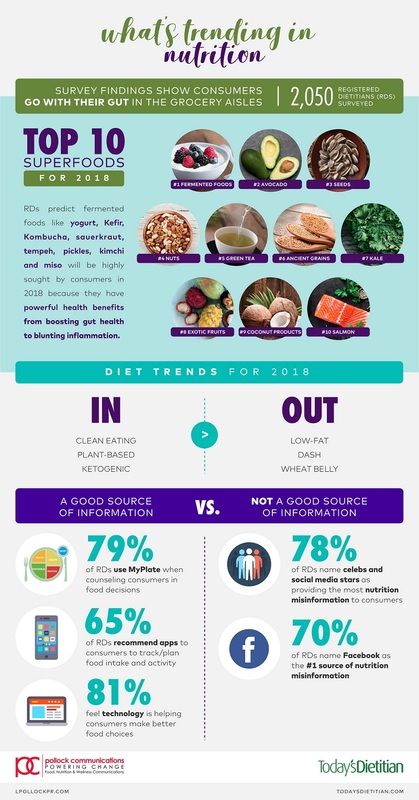 The Pollock Communications and Today’s Dietitian’s “What’s Trending in Nutrition” survey, which polled 2,050 registered dietitian nutritionists (RDNs) nationwide, also predicted that “clean eating” and plant-based diets will remain the two most popular diet trends for 2018. However, the ketogenic diet — a low-carb regimen that allows generous consumption of fats and protein — moved up to the No. 3 spot in the annual survey, surpassing the paleo diet in popularity. "The movement toward clean eating reflects a change in how consumers view food," said Jenna A. Bell, a registered dietitian and senior VP at Pollock Communications. “Consumers are searching for nutrition information and equating diet with overall well-being." The rising popularity of fermented foods illustrates that consumers have expanded their definition of wellness to include benefits like gut health, she said. “Consumers are digging deeper for information about the food they eat, and in this instance, finding out why yogurt, kefir or kimchi is so good for them," said Bell. The dietitians’ top recommendations for 2018 are to limit highly processed foods, increase fiber intake, keep a food journal and choose non-caloric beverages such as unsweetened tea or coffee.